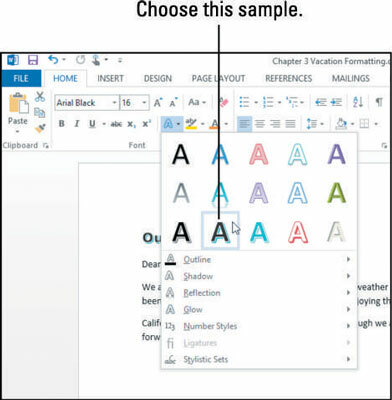 You can modify Word 2013 text with a variety of attributes, such as bold, italic, underlining, and so on. You can apply some of these from the Mini Toolbar and/or the Font group on the Home tab. 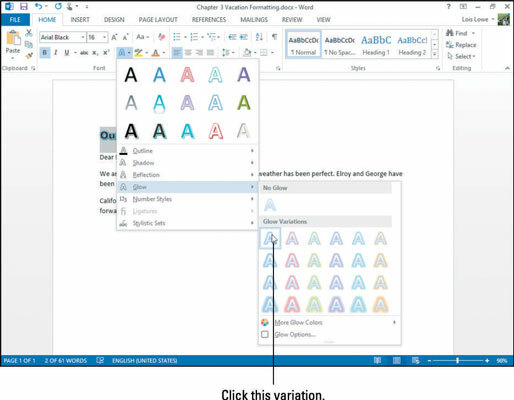 Others are available in the Font dialog box. Some of them also have keyboard shortcuts. Here you see a summary of the keyboard shortcuts for some common text formatting attributes, followed by displays of some of these attributes. You can apply text effects, or WordArt effects, such as outline, shadow, reflection, and glow. Here are some examples of these effects, accessed from the Text Effects button’s menu on the Home tab. The Text Effects button’s menu also includes a number of presets that combine color fills, outlines, and other effects in one operation. In a Word 2013 document, select some text you want to emphasize. Choose Home→Text Effects and Typography, and then click the second sample in the bottom row. The text becomes black with a blue shadow. Click the Text Effects button again, point to Glow, and click the first effect in the Glow Variations section. Select the Small Caps check box, and then click OK.